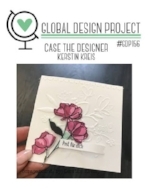 This week over at the Global Design Challenge we have a CASE (Copy And Selectively Edit) the Designer challenge. Here is my card. This was a fun card to CASE. It is beautiful in its simplicity, and I decided to keep my colour scheme simple as well, using neutral colours in similar tones. I used So Saffron for my main element and used the lovely flower spray from Wishing You Well, stamped with Soft Suede. I cut it out with the Layered Ovals Framlits along with a scallop oval in Crumb Cake. I used the Basket Weave TIEF to add texture to my Soft Suede backdrop and layered on to So Saffron with a Crumb Cake card base. My greeting is from the Host set Hand Delivered, I love the font on these greetings! I cut out the greeting with one of the Lakeside Framelits, and mounted it with Dimensionals. A Gold Faceted Gem adds just the right amount of colour coordinated bling.